The new Chemical and Biomedical Engineering Building, a 109,100-square-foot, six-level facility near the intersection of Shortlidge and Curtin Roads, houses the Departments of Chemical Engineering and Biomedical Engineering. 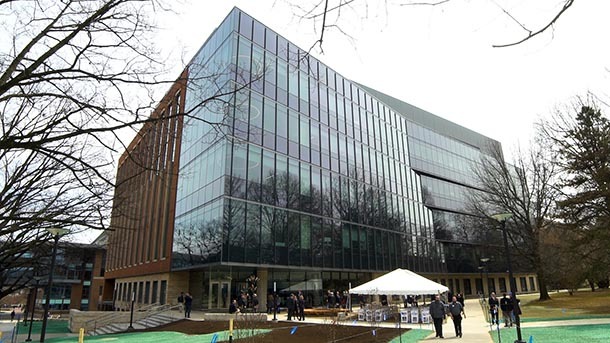 UNIVERSITY PARK, Pa. — A ribbon-cutting ceremony on April 4 marked the official opening of the new Chemical and Biomedical Engineering (CBE) Building on the Penn State University Park campus. The 109,100-square-foot, six-level facility near the intersection of Shortlidge and Curtin Roads houses the Departments of Chemical Engineering and Biomedical Engineering. The recently completed $144 million building was designed by architectural firm HOK, and construction was managed by general contracting company Barton Malow. The structure features a variety of laboratories, classrooms and conference rooms, student common areas, the Dow Chemical Knowledge Commons collaborative student space, and an auditorium for presentations and classes that holds approximately 150 people. In his remarks at the ceremony, Justin Schwartz, the Harold and Inge Marcus Dean of the Penn State College of Engineering, envisioned high-impact research and teaching happening in the building, with great potential benefits for society. Joining Schwartz as speakers at the ceremony included Penn State President Eric Barron; Robert Fenza, University Board of Trustees member and retired executive vice president and chief operating officer of Liberty Property Trust; Phillip Savage, head of the Department of Chemical Engineering; and Cheng Dong, head of the Department of Biomedical Engineering. Since 2012-13, the Department of Biomedical Engineering has grown from 9 to 20 faculty, with plans to hire four more in the next several years. The number of students has also expanded rapidly. “The ‘neighborhood’ concept locates together different labs conducting similar research, which will facilitate collaborations and build more bridges between research groups,” said Savage. The building was constructed with environmental concerns in mind. It was aligned as not to disturb the root systems of the nearby dawn redwood trees, and more than one ton of recycled glass was used for the terrazzo floor in the main lobby. Another feature has less to do with the CBE Building itself, and more to do with its location. Situated in the middle of University Park’s life sciences, chemical sciences and materials sciences hub, the CBE Building is well-positioned for interdisciplinary collaboration. The new amenities are expected to help attract top faculty members and students to both departments. Staff and some faculty members and graduate students have moved into their new office spaces, with the rest of the faculty and graduate students moving in during late spring and early summer. Laboratories are scheduled to be fully functional by late summer, with the first classes in the new building taking place this fall. Penn State College of Engineering is one of the leading academies for engineering education, research, and service in the United States. Established in 1896, the College of Engineering is the largest academic unit at University Park, consisting of 12 academic departments and schools supporting 45 undergraduate majors, minors and certificates, 39 master’s programs and 18 Ph.D. programs. The College of Engineering’s more than 13,000 students, 400 faculty, and 100,000 living alumni are dedicated to inspiring change and impacting tomorrow. For more information, visit engr.psu.edu.